Just two weeks to go until the second season. TWO WEEKS FROM today, we’ll all be scarpering home from work to binge season two of Queer Eye. How exciting. In all honesty, we didn’t see the crop top coming, but it is a nice change from his endless collection of The Strokes t-shirts. Aaaaand Bobby putting in the real work while everybody else is having fun. 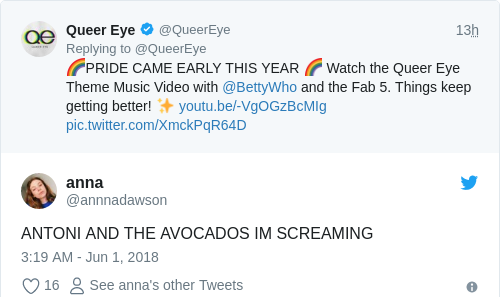 Queer Eye fans on Twitter are enjoying the music video very much. In particular, the parts with Antoni. Email “The Queer Eye cast have released a music video to get us excited for season two ”. Feedback on “The Queer Eye cast have released a music video to get us excited for season two ”.